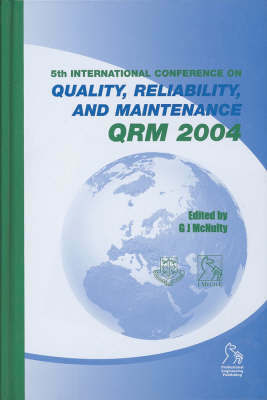 The papers included in this volume were presented at the 5th international conference on Quality, Reliability and Maintenance which took place at the University of Oxford in April 2004. They highlight the importance of the QRM disciplines and represent the latest developments, trends and progress, and are essential reference material for all reasearch academics, quality planners, maintenance executives and personnel who have the responsibility to implement the findings of quality audits and maintenance policy. "Quality, Reliabilty, and Maintenance" - be it in industry, commerce, education, or academia - influences and guides every contemporary aspect of our lives. This collection of papers includes topics such as: Quality Analysis; Condition Monitoring; Maintenance Management; Computer Applications; Education and Training; and, Research Applications.